Angel City Brewery and The Surfrider Foundation team up to clean up! Sign up today to show the treasured beaches of SoCal some love and enjoy an ice cold pint with like-minded friends at Angel City Brewery hosted afterparties. Added by Deborah Baber-Savalla on May 11, 2018. 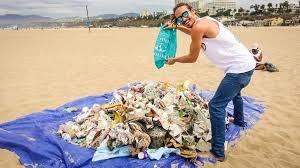 Los Angeles, CA (May 9, 2018) — DTLA’s Angel City Brewery and the Surfrider Foundation have joined forces to host beach cleanups in a series aptly named It’s Summertime, Beaches. Beginning May 12, the organizations will work towards Surfrider’s mission of protecting the world’s ocean, waves and beaches, with events happening around the area’s seaside communities – Laguna Beach, Long Beach, Hermosa Beach, Huntington Beach, Santa Monica, LA and Ventura – running through late July. Participation is $10 and attendees are encouraged to sign up ahead of time. All cash proceeds will go directly toward the event’s respective Surfrider chapter. Participating volunteers will receive all the tools necessary to participate in the cleanup, an Angel City x Surfrider t-shirt – made of eight recycled plastic bottles – and an after-party invitation to celebrate their hard work. Attendees are encouraged to walk, bike, carpool or take public transportation to these events. 6/16 | Huntington Beach – International Surfing Day! Angel City Brewery brews beer for the greater LA area and beyond at their Downtown based brewery in the heart of the Arts District. The brewery’s Public House features a 19-tap bar that serves an ever-changing roster of classic and newly inspired beer, and is open seven days a week with a full calendar of events ranging from trivia nights to art shows, live music and festivals. The Public House is open Monday-Thursday, 4:00pm – 1:00am, Friday 4:00pm – 2:00am, Saturday 12:00pm – 2:00am and Sunday 12:00pm – 1:00am. To donate directly to Surfrider, visit http://surfrider.org/support-surfrider. For more information on how you can get involved in a clean-up, visit angelcitybrewery.com/summertimebeaches/. About Angel City Brewery | LA is often viewed through a lens of Hollywood, glitz and glamour, but at Angel City we see things differently. Our mission is simple: to shine a light on the eclectic underbelly of what has been referred to as the other LA. Our home in the Downtown Arts District is the center of a cultural revival for the city’s most talented artists, musicians, hustlers, and craftspeople. It’s an LA that’s as creative as it is diverse, and our beer is no exception. Through our beers and hand-chosen partnerships we seek to bring the allure of the Arts District experience to greater LA and beyond. Find Angel City on draft or in 6-packs at bars, restaurants and retail locations throughout California. Visit the Brewery and Public House downtown for a brewery tour, tasting or weekly event, located at 216 Alameda Street, Los Angeles, CA 90012. Angel City Brewery is an A&S Brewing Collaborative brand, a subsidiary of the Boston Beer Company. Angel City Brewery is online at www.AngelCityBrewery.com, on Facebook and on Twitter.